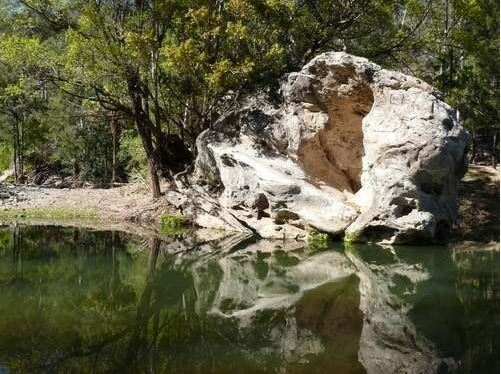 The Rock Pool has been carved from the bed of Carnarvon Creek by the turbulent water of past floods. Rest in the shade of fig and casuarina trees and watch for platypus and turtles. Stop at the first pool if you must but there is a much bigger and deeper second pool just downstream. The picnic area includes toilets but no longer has a gas barbecue. 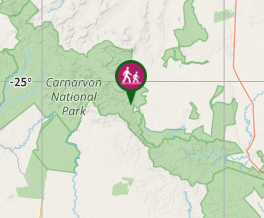 This is the only place in Carnarvon Gorge designated for swimming. If swimming, please do not jump or dive into the pool. A wonderful spot for a swim in Carnarvon Creek to cool off on a 40° day. Even shared the first pool with an old male grey kangaroo. For a better swim go a little further downstream from the first pool then cross over near a belt of river oaks to a much bigger and deeper pool. The picnic tables close to the creek are well-shaded and a coooler place for lunch that many of the camp sites. Easy walk from the carpark, worth a visit. Easy walk, rock pool was freezing but it looks pretty. This walk is much more easily accessible than the longer walks, but is never the less really good.